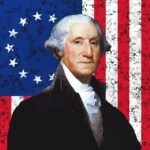 George Washington led the continental army to victory over Great Britain in the American Revolutionary War. He served as the first President of the United States, presided over the writing of the constitution, and established a cabinet system. In young adulthood, Washington was given the rank of Major in the Virginia Militia, and after successfully delivering a message to a French commander demanding that he and his soldiers leave Virginia territory, Major Washington made an arduous 900 mile journey back earning him an international reputation after the hardships he endured were published both in Williamsburg and London. As a Lieutenant Colonel, a campaign to assert Virginia’s territorial claims ended in humiliation for Washington after surrendering to the French at Fort Necessity, thus igniting the French and Indian war. He relinquished his commission, but later aided General Edward Braddock who had been sent by the king of England to force the French from the Ohio territories. 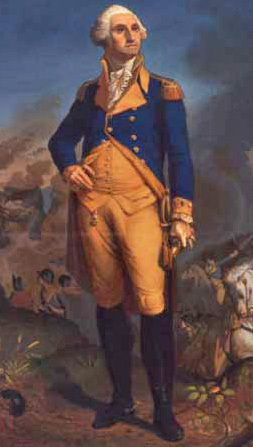 Washington’s bravery earned him command of Virginia’s entire military force. In 1774, he made a Virginia Representative to the Continental Congress and in June of 1775, George Washington was commissioned as Commander In Chief of the Continental Army. In March of 1776, the British withdrew from Boston. A new British army under the command of Sir William Howard descended on New York City. Washington ordered his army to retreat across New Jersey. They crossed the Delaware River in the dead of winter, and defeated the British in two battles retaking New Jersey. Revolutionary forces captured two major British armies in Saratoga in 1777, and Yorktown in 1781. 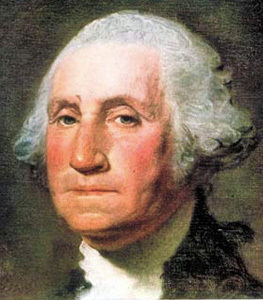 Washington later presided over the United States Constitution in 1787, and in 1789 George Washington was elected as the first President of the United States. During his presidency, George Washington improved infrastructure, promoted commerce, and created a sense of nationalism. He was married to Martha Dandridge since 1759. After his death because of epiglottitis and hypovolemic shock in 1799, George Washington was held as first in war, first in peace, and first in the hearts of his countrymen.